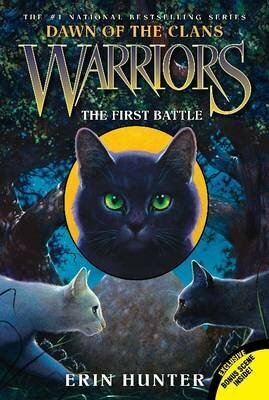 Discover the origins of the warrior Clans in the third book of this thrilling prequel arc from mega-bestselling author Erin Hunter. The Dawn of the Clans series takes readers back to the earliest days of the Clans, when the cats first settled in the forest and began to forge the Warrior code. The rivalry between Gray Wing and Clear Sky has driven a bitter wedge between the forest cats. As Thunder and Gray Wing struggle to find a peaceful path for the future, tensions are growing. What began as a misunderstanding between two brothers has spread far and wide-and now every mountain cat, rogue, and kittypet in the forest will be forced to pick a side. Dawn of the Clans #3: The First Battle also contains an exclusive bonus scene and a teaser to Dawn of the Clans #4: The Blazing Star.